Cronin Stadium to feature the Legion system. Our old stadium field was grass and we had to limit the use to game-day. 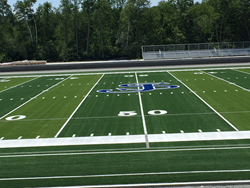 The Shaw Sports Turf surface provides much more flexibility and more playing time for our students. Maintenance requirements are also less. R.A.D. Sports is a family-owned business that specializes in the construction of high-quality athletic and recreation facilities. R.A.D.’s projects are located throughout New England and the Mid-Atlantic regions. Since 1994, R.A.D. Sports has grown to be one of the most trusted and successful athletic and recreation facility contractors in the industry. Rob and Derek Delmonico, owners of R.A.D. Sports, provide hands-on management of each project. They bring a solid foundation of knowledge and experience to each project and have dedicated themselves to building a company with the finest reputation in the industry. Visit their website at http://www.radsports.com or call 781-871-4400.